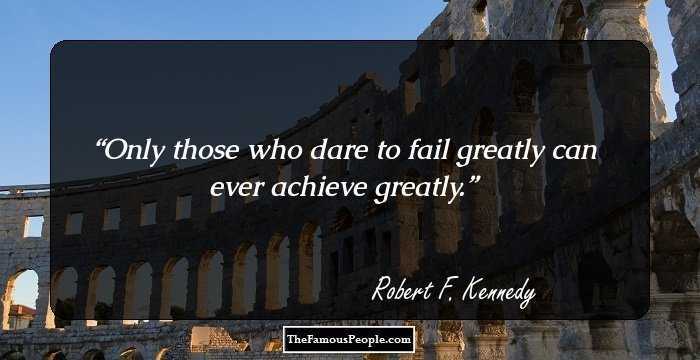 A collection of Robert F. Kennedy quotes and sayings on politics, democracy, belief, civil rights, courage, diversity, dreams, freedom, history, human rights etc. Robert Francis ‘Bobby’ Kennedy, a lawyer by profession, was instrumental in managing the presidential campaign of his brother John F. Kennedy. 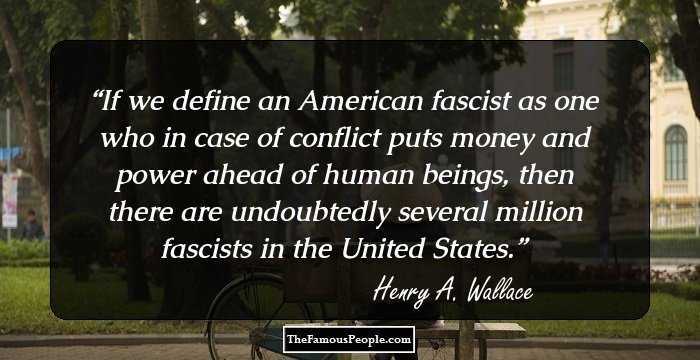 He was appointed the Attorney General of the United States in 1960. Being a member of the Democratic Party, he was seen as a face of modern American Liberalism. Under John’s presidential tenure, Robert served as his closest advisor. Robert was popular for his defense for the Civil Rights Movement. He was also instrumental for dismantling organized crime and Mafia. Before his stint in politics, he served in the U.S. Naval Forces as a seamen apprentice in the Second World War. After his brother’s assassination, he took part in the elections of 1968, appealing to the African-American, poor, Catholic and young voters in the country. Much like his brother, Robert was later assassinated after his victory against Senator Eugene McCarthy. 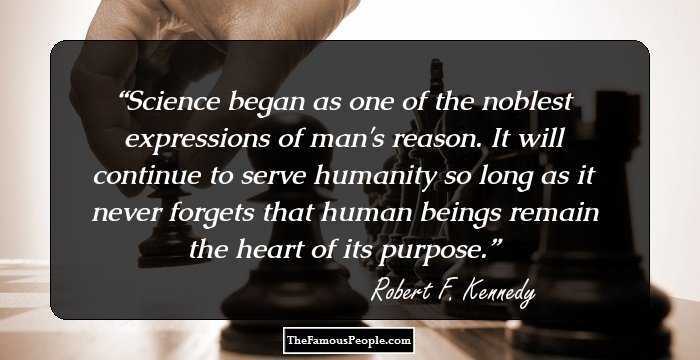 We have collected Robert F. Kennedy quotes from his speeches, writings, interviews etc. 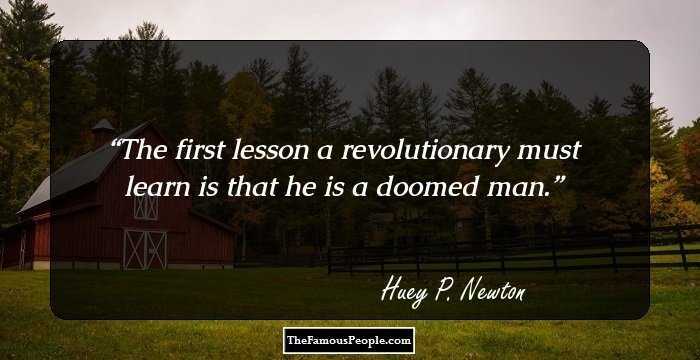 Here are some interesting quotes from this legendary American politician. 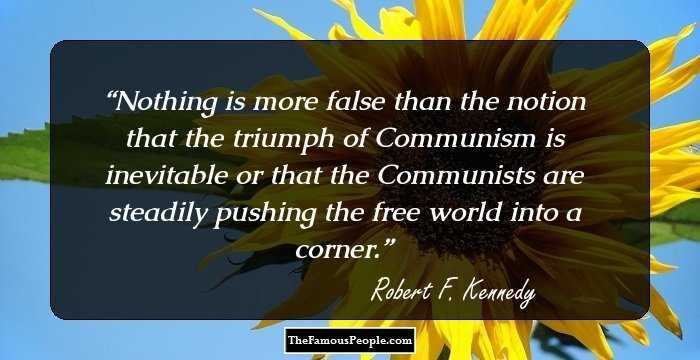 Nothing is more false than the notion that the triumph of Communism is inevitable or that the Communists are steadily pushing the free world into a corner. If the purpose of the wall was to destroy Berlin, Herr Ulbricht and his cohorts have erred sadly. Berlin is not only going to continue to exist - it's going to grow and grow and grow. Its ties to West Germany will not be severed. 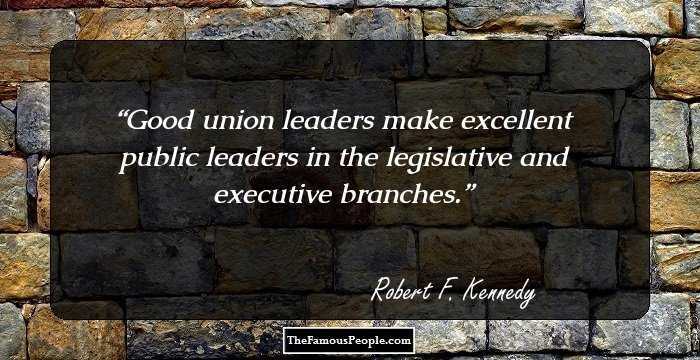 Good union leaders make excellent public leaders in the legislative and executive branches. Science began as one of the noblest expressions of man's reason. It will continue to serve humanity so long as it never forgets that human beings remain the heart of its purpose. Lack of education, old age, bad health or discrimination - these are causes of poverty, and the way to attack it is to go to the root. We develop the kind of citizens we deserve. If a large number of our children grow up into frustration and poverty, we must expect to pay the price. The travail of freedom and justice is not easy, but nothing serious and important in life is easy. 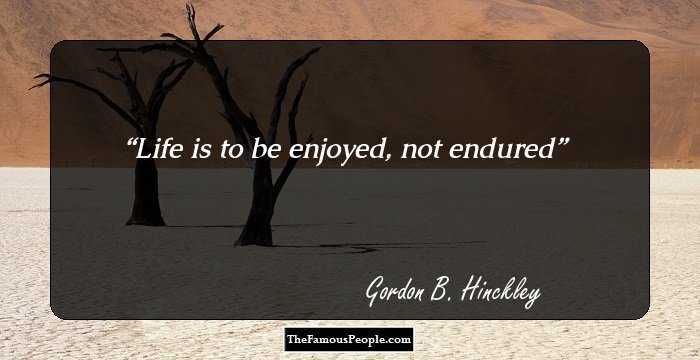 The history of humanity has been a continuing struggle against temptation and tyranny - and very little worthwhile has ever been achieved without pain. Everything that makes man's life worthwhile - family, work, education, a place to rear one's children and a place to rest one's head - all this depends on the decisions of government; all can be swept away by a government which does not heed the demands of its people, and I mean all of its people. What is learned on the athletic field is not forgotten, nor are the lessons of character that are forged there ever lost. Consider the contributions in the field of public life, business, law, medicine, and the military of those who actively participated in athletics. The Gross National Product measures neither our wit nor our courage, neither our wisdom nor our learning, neither our compassion nor our devotion to our country. It measures everything, in short, except that which makes life worthwhile, and it can tell us everything about America - except whether we are proud to be Americans. The leaders of the world face no greater task than that of avoiding nuclear war. While preserving the cause of freedom, we must seek abolition of war through programs of general and complete disarmament. The Test-Ban Treaty of 1963 represents a significant beginning in this immense undertaking. One of the primary purposes of civilization - and certainly its primary strength - is the guarantee that family life can flourish in unity, peace, and order. America's answer to the intolerant man is diversity - the very diversity which our heritage of religious freedom has inspired. We in the United States believe in the protection of minorities; we recognize the contributions that they can make and the leadership that they can provide; and we do not believe that any people - whether majority or minority, or individual human beings - are 'expendable' in the cause of theory or of policy. We will find neither national purpose nor personal satisfaction in a mere continuation of economic progress, in an endless amassing of worldly goods. We cannot measure national spirit by the Dow Jones Average, nor national achievement by the Gross National Product. If freedom makes social progress possible, so social progress strengthens and enlarges freedom. The Gross National Product includes the destruction of the redwoods and the death of Lake Superior. It grows with the production of napalm and missiles and nuclear warheads... It includes... the broadcasting of television programs which glorify violence to sell goods to our children. 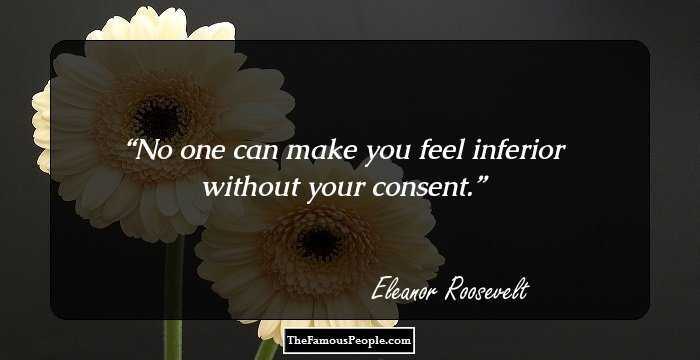 We know that we cannot live together without rules which tell us what is right and what is wrong, what is permitted and what is prohibited. We know that it is law which enables men to live together, that creates order out of chaos. We know that law is the glue that holds civilization together. To the extent that laws are founded on morality and on logic, they can lead men's hearts and minds. A high standard of living cannot remain the exclusive possession of the West - and the sooner we can help other peoples to develop their resources, raise their living standards, and strengthen their national independence, the safer the world will be for us all. In government, our chief executives have been lawyers. The great majority of our cabinets and congresses are and have been men trained in the law. They have provided the leadership and the statecraft and the store of strength when it was needed. It certainly should not surprise us that a young person without any real stake in a legitimate occupation or career may get into trouble more easily. Such persons readily accept the idea that they have been unjustly deprived of money, status, and opportunity. The United States was born in revolution and nurtured by struggle. Throughout our history, the American people have befriended and supported all those who seek independence and a better way of life. Circumstances of crimes vary. 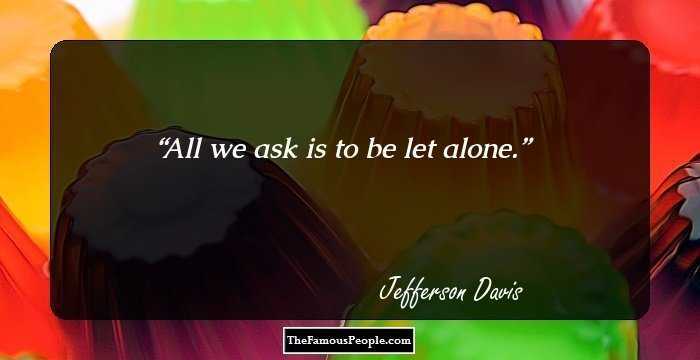 So do motives. And so do prospects for rehabilitation. 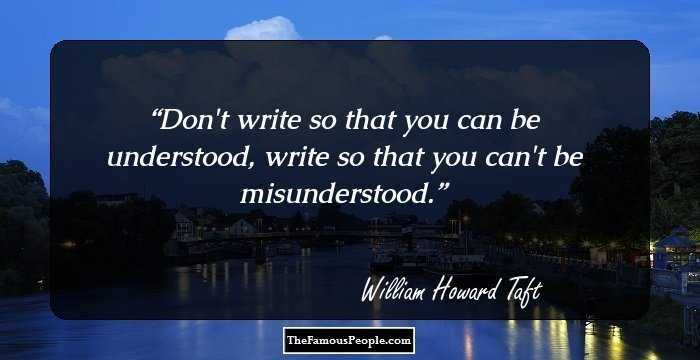 The number of imponderables makes it impossible to sentence by formula and still sentence justly. When I was counsel for the Senate Rackets Committee, about 25% of the important leads which our committee developed came from newspapers. This increased my respect for those courageous newspapers which assisted us. It also caused me to look with wonderment at some of the newspapers that did not. The hardest problems of all in law enforcement are those involving a conflict of law and local customs. History has recorded many occasions when the moral sense of a nation produced judicial decisions, such as the 1954 decision in Brown v. Board of Education, which required difficult local adjustments. In truth, the world is now a seamless web from which no nation, large or small, young or old, can disassociate itself. Every attitude and every action of every nation can affect the welfare and security of every other nation around the globe. Desegregation of schools does not automatically transform them into better schools. It is only a step. The larger goal is to see that the education of our youth is not merely desegregated, but that it is excellent. From the first moment of independence, the United States has been dedicated to innovation as a way of government and a way of life. The history of antitrust law enforcement shows that successful antitrust prosecutions have often strengthened and brought vitality to extremely large companies and businesses. In the last analysis, our every right is only worth what our lawyer makes it worth. There has been far too much hypocrisy in the field of civil rights. It is easy enough to give rousing speeches or call for legislation which has no possibility of passage. When our forbears - yours and mine - came to America, they came because this country promised them something. It promised them an opportunity, nourished by education, not merely to grind for a bare living, but to strive for a good life. President Kennedy's election was such an enlargement. It expanded religious freedom to include the highest office in the land. President Kennedy's administration was such an enlargement. It advanced the day when the bars of intolerance against all minority groups will be lifted, not only for the presidency, but for all aspects of our national life. I do not run for the presidency merely to oppose any man, but to propose new policies. I run because I am convinced that this country is on a perilous course and because I have such strong feelings about what must be done, and I feel that I'm obliged to do all I can. 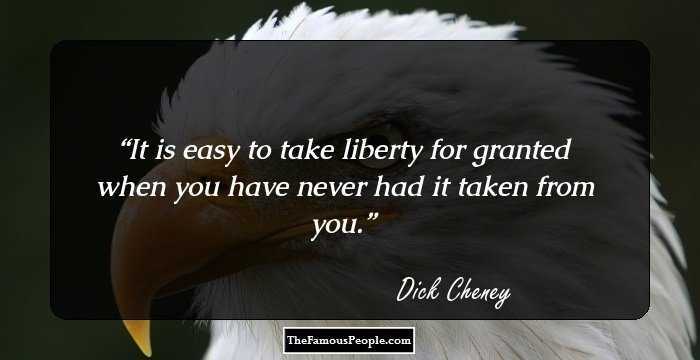 Freedom possesses many meanings. It speaks not merely in terms of political and religious liberty but also in terms of economic and social progress. The eradication of racial and religious prejudice in the United States - and in the rest of the world as well - is a long-term process. Within the United States, we have put great emphasis upon political freedoms. Because it has been our experience that these freedoms can lead to others. American books reflect our common heritage with many other nations and their influence upon our culture. The influences are endless, linking us with the rest of the world. Thus, they are good ambassadors for us. Let me make it clear that the Youth Employment Opportunities Act of 1961 is not primarily concerned with delinquency prevention. Rather, it is designed to help all types of young men or women who suffer deficiencies of training or opportunity which keep them unemployed. I am ashamed to report that my father, who is 73, has never been beaten by any of his four sons in golf. We have all become resigned to the fact that he has determined that he won't be beaten.